Trump also congratulated Lee on Singapore’s assumption of the chairmanship of the Association of Southeast Asian Nations (ASEAN). Trump met with Lee at the prime minister’s official residence, the Istana, accompanied by Secretary of State Mike Pompeo; National Security Adviser John Bolton; Sarah Huckabee Sanders, White House press secretary; and John Kelly, White House chief of staff. Singaporean officials in attendance included Deputy Prime Minister Tharman Shanmugaratnam and the ministers of Foreign Affairs, Home Affairs, National Development, Communications, and Education. The lunch also included a surprise early birthday cake for President Trump, who will celebrate his 72nd birthday on June 14. “Mr. Trump hosted me at the White House last October, so I was glad to reciprocate his hospitality,” Lee said in a Facebook post after the meeting. “I wished him all the best for tomorrow’s summit, which we hope will be a first step on the path to peace. Looking forward to a positive outcome,” the prime minister added. 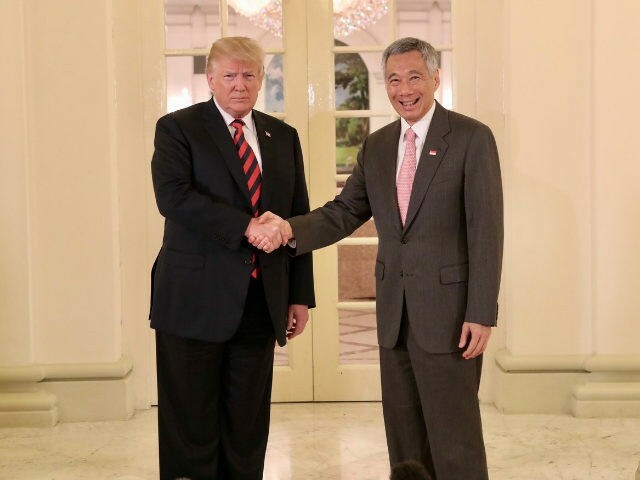 Trump accepted an invitation from Singapore’s President Halimah Yacob to make a state visit to Singapore in November during the sixth annual ASEAN-U.S. Summit. The White House announced that U.S. Ambassador to the Philippines Sung Kim, who has been the lead contact with North Korea on summit negotiations, held a working group meeting with the North Korean delegation on Sunday to make final preparations. Kim Jong-un held a meeting with Prime Minister Lee earlier in the day on Sunday, having arrived in Singapore several hours ahead of Trump. “The entire world is watching the historic summit between the DPRK and the United States of America, and thanks to your sincere efforts … we were able to complete the preparation for the historic summit,” Kim told Lee, according to the South China Morning Post (SCMP). The St Regis was guarded by police officers from Singapore’s Gurkha Contingent as well as the Special Operations Command – two of Singapore’s most elite internal security teams. Joining them were North Korean guards in dark suits pinned with red badges showing portraits of Kim Il-sung and Kim Jong-il, the current leader’s predecessors. Tourists, most dressed in Bermuda shorts and T-shirts to cope with Singapore’s sweltering heat, jostled for space with the press for pictures of Kim’s arrival at the hotel – located in the centre of the diplomatic quarter of Tanglin. Some others positioned themselves in the balcony of a neighbouring hotel. The sheer length of Kim’s cavalcade, which included police cars and an ambulance, meant some of those in vehicles at the tail end of the convoy had to wait up to 15 minutes to enter the hotel after the arrival of the leader. The flight path for the plane presumably carrying Kim – his travel arrangements were kept deliberately vague – kept it within Chinese airspace for as long as possible, with civilian air traffic kept out of the way, even when the plane passed through normally busy air traffic corridors. Based on images the Singaporean government released, Kim arrived on an Air China plane. Accompanying him was Kim Yong Chol, who earlier this month met with President Trump to hand deliver a letter from Kim, CNN reported. A plane from Air China was detected at the airport in Pyongyang at 8:30 am. Initially, it was flying to Beijing but later changed its flight number from CA122 to CA61,destined for Singapore, according to Flightradar24, a Swedish-based flight route-tracking website. Yonhap reported that Chammae-1 – an Ilyushin-62M passenger jet – Kim’s official plane, also left Pyongyang Sunday morning. South Korean media said the plane can fly at a maximum speed of 900 kilometers per hour and carry about 200 people, with a maximum range of 9,200 kilometers. Although the distance between Pyongyang and Singapore is 4,700 kilometers, which is within the plane’s flight range, the Chammae-1 has reportedly never flown that far. An Air Koryo Il-76 is also tracking south through China, Flighttradar24 said. The aircraft is believed to be carrying food and other supplies for Kim, the Strait Times reported. According to a White House statement on Monday, the summit between Trump and Kim will begin at 9:00 a.m. local time on Tuesday and conclude with a press conference at 8:00 p.m. before the president returns to the United States. This translates to a 9:00 p.m. Eastern Monday summit start and an 8:00 a.m. Tuesday morning conclusion.